I have a half moon damper door where the heat and smoke enters the cooking chamber. Also have a half moon welded in the front of the smoker from the top of the tank down to just below the lower cooking grate. This creates a funneling affect for smoke and heat. The chimney is extended down from the top in to this funnel about 5 inches. I've never tried the tuning plates but having been thinking strongly about it. Will probably add those soon. Slide out racks are a must also. I don't have them now but am about to. Nothing worse then having your head stuck inside the cooker all day. I also think an onboard propane starter is a good idea. You'll get that heavy iron heated up a lot quicker to. One last thing,,,,,,,,,a 2 inch clean out in the bottom. Mines to small now but won't be for long. This has been an ongoing project for 15 years so it's seen lots of cooking time. Any info is good info Thanks Eh. 16GA won't hold its shape rolled unless you can corrogate it like a 55gal drum. Make a frame out of 1/8x1" strips around it to help it hold its shape and to act as a smoke seal and keep it from falling through. The main lesson I have learned (the hard way ) is put your doors on last. Every time you weld on your cooker, it can warp. So do all your other welding inside and out before you put your doors back on. Then once you have tweaked and bent on them to make them fit, you won't have to do it again if you warp it welding on the smokestack or firebox. The water is kinda under the bridge but this may help. You might want to weld on some straps (like those on a oak barrel) to help maintain the shape of the cylinder. The best idea would be to leave a two inch strip between two smaller doors but many folks would think that it would get in the way. 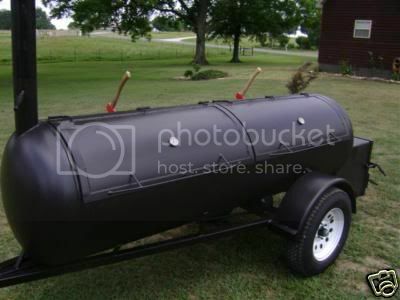 My new project is a trailer mounted smoker, made out of a 5 ' piece of 1/4" pipe. That was the thickest I could find around here and it wasn't cheap. I just got my firebox fabbed up and connected yesterday. My next question is what should be next? Cooking grates and tuning plates, or cutting the doors? Or finishing the firebox? I think I'm going to leave the end caps off to the very last for easy access for any modifications inside. Any thought? I'm in the process in building pull-out racks for the cooker I'm building from scratch. It calls for 1x1x1/4. At the door opening another 1x1x1/4 brackets is welded at the end so the rack doesn't tip out. Does anyone have any seigns/ ideas to something better? Here are som pictures of two different ways I did some pull out shelves. In the picture on teh right you can see how the supports are in place. the angle iron in teh middle is turned to have a flat surface for support in teh middle of the rack. Also, you can see a small strip welded to the angle iron on the far right to keep the rack from tipping when pulled. On the second one I made two side by side slide ot shelves. Not sure if this helps but they both work great. I stubmled on this site searching for design concepts for smokers and found Alien BBQ's post most informative. Thank you for that! My wife and I just completed a kitchen remodel (we both love to cook and entertain) and are turning our sights toward the yard. There is a brick charcoal grill that we hardly use and I thought it might be worthwhile to convert it to a smoker. We have natural gas and power in the yard and I'm pretty handy, so building a "set it and forget it" system seems feasible. My original thoughts are to remove the grill assembly and fabricate stainless racks, door and roof vent. Then add a gas firebox with an automatic fill water reservoir and auger feeder in the lower portion with air intake. Any thoughts, advice, and warnings would be greatly appreciated! 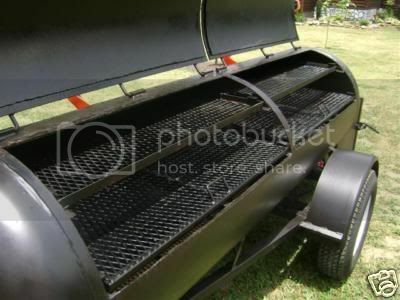 Well I built mine before I saw this post, Mine is an offset , but a bit diffrent, my firebox is welded to the cooking chamber , A 6 inch pipe runs the length of the cooking chamber , with holes allong the top of it, small holes at the firebox end and larger holes at the other end, I built a stainless valve to have control of how much smoke/heat goes in, my exhaust is the same size pipe , with a damper valve to slow the flow or open it up to make a better draft, My firebox also has adjustments for airflow to slow the burn. Posted: Mon Jul 27 09 11:28 pm Post subject: Tuning Plates - How many? 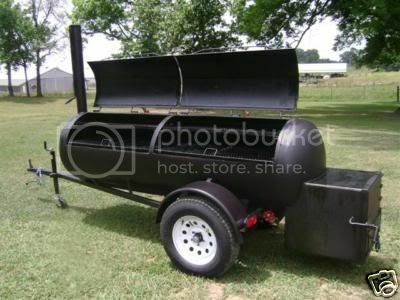 I just bought the smoker in the pictures below. The guy that built if fabricated up 4 tuning plates that are about 12" wide. I cooked on it for the first time this weekend with the plates mainly on the end closest to the box, with about a 1" gap between them. I was still getting about a 25 degree temperature variation from the middle of one side to the middle of the other. Should I get someone to fabricate me three or four more tuning plates and run them the rest of the way across? By the way, the Q ended up great - just had to move the meat around a little during the cook to keep everything cooking even. Great write-up man thanks for all this information. I am going to be picking your brain here soon about some questions I am going to come up with while modifying my current set-up. Thanks for the great post. I'm currently in the process of restoring and modding a brinkmann SNP pro. Everything is going well, however, I have some concern about the gauge of sheet metal that I have purchased for my tuning plates. I believe that I picked up 22 gauge to use as my tuning plates. I went ahead and created a baffle using the 22 gauge so I wouldn't have too hard of time bending the sheet metal. Should I consider going with a thicker gauge for the tuning plates, or will I get by okay? Thanks for the great information. I've never used steel pits, but a friend of mine said that the taste is not so good if we use steel pits. Is that true? WOW, everything you need to know right here in this post about smokers. love it. great post. I'm a Spammer Please Ignore me! I've got some 4'x8'x1/8" (11ga) diamond plate, just wondering what would be the size after it is rolled. I wanna do a Fat 40 or 50 clone, will 1 sheet rolled do or will I need to get two rolled?